An ionic foot bath is designed to restore your body’s energy levels and balance. It facilitates and aides your natural detoxification processes and reestablishes the proper pH and electromagnetic energy. At Velocity Wellness Center, we utilize Energy Balance Resource’s Cellular Cleanse Therapy. It involves a direct current that creates an energy field similar to the energy that is naturally produced by the body. You will not feel anything during the session. The therapy alters the electron and proton load in the water, creating an electromagnetic altered environment. The energy is similar to that used in cold laser therapy, which has been proven to create ATP or cellular energy. With this increase, your cells can operate and detoxify at a higher rate than usual. In turn, your cells can withstand chemical and physical stressors. You will place your feet in the water and let the ions flow over them. The electrical contact touches all primary meridians of your body to change its overall electrical conductivity. The establishment of these proper paths will help your body return to a state of balance. You will then have higher energy, more mental clarity and an increased sense of well-being. You may have heard of the power of walking along the beach to absorb millions of negatively-charged ions. Our foot bath recreates this same environment. Restore the balance to your body. 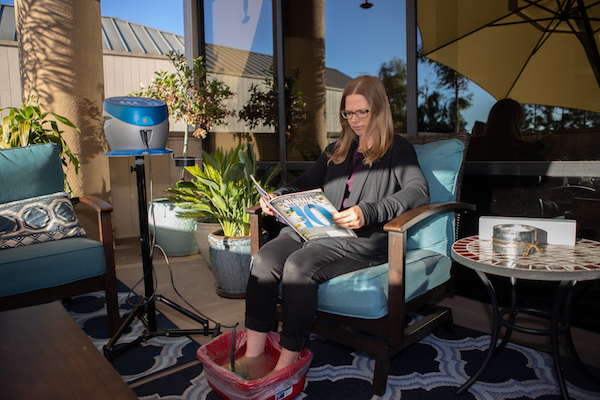 Contact Velocity Wellness Center today to schedule your first appointment for an ionic foot bath.